The stocking itself is a gift, if you stuff it with stocking stuffers, so much better but the owner of this personalized Christmas stocking will be super impressed with just the stocking itself. Material is soft fleece stocking with three dimensional Rudolph holding a Christmas stocking with a couple of green branches. This is probably one of our top 5 favorite personalized Christmas stockings this year. There is no way we can show on the photo how much quality and workmanship went into this adorable Christmas stocking. The stocking measures 19 inches from the loop on top left hand corner diagonally down to the toe. The opening on top of the stocking is 8 inches wide. 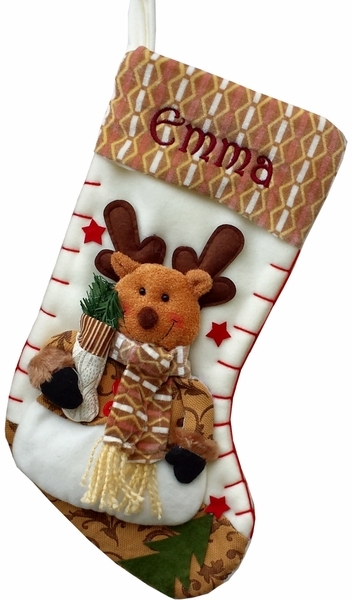 Names can be personalized on the of this Christmas stocking with metallic embroidery thread to compliment the appliqué design. We have a sample picture of the stocking monogrammed with WHITE SHIMMER embroidery thread ... click on the thumbnail image in the top right hand corner of this page to see a larger version.